A College of Medicine senior announces her residency match to the crowd at Match Day. More than 160 students participated in the 2019 Match. March 15, 2019 | Dreams really can come true — and for the 160-plus College of Medicine seniors who attended the annual Match Day event on Friday, those fulfilled wishes came in the form of envelopes that revealed where they will spend the next three to seven years as they complete their residency training. 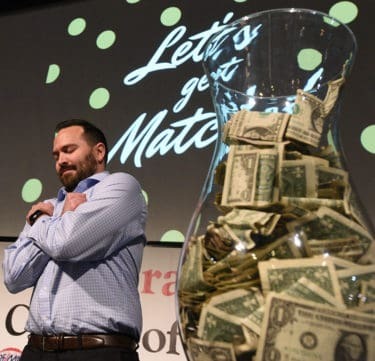 Each year Match Day starts at 11 a.m. Central Time, with senior medical students all over the nation simultaneously opening envelopes to reveal their “match” — or where they have been accepted to continue their training in a specialty residency. Students react after learning their residency matches. Not everyone matches in the first round, and there are subsequent matching processes that try to account for that. 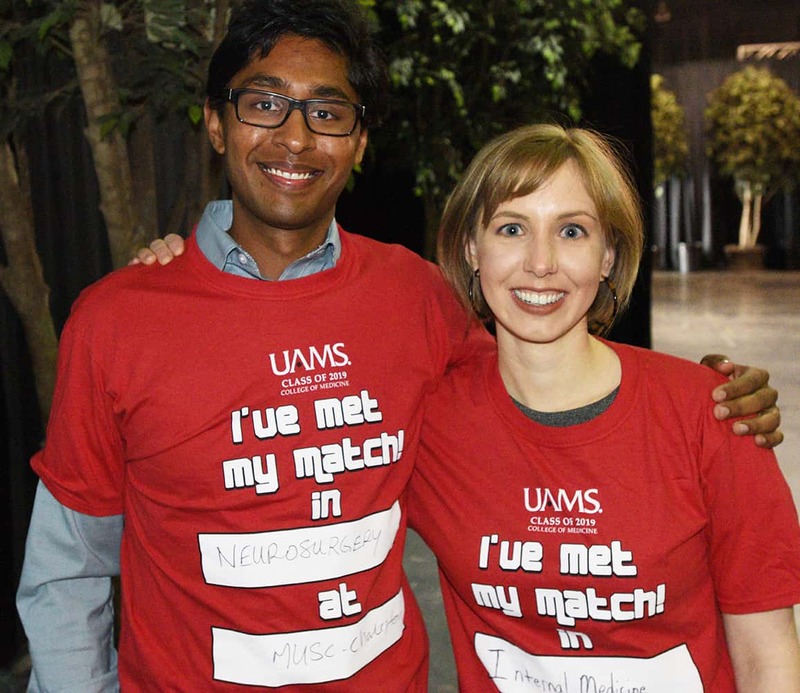 This year, 167 UAMS College of Medicine senior students participated in the match. One-hundred-sixty-three took part in the NRMP match. 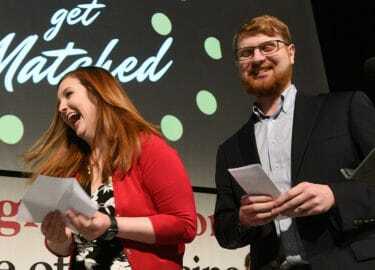 Eight graduating seniors who attempted to match did not do so initially. However, since the first round, all of the students who sought positions have placed through other matching processes. 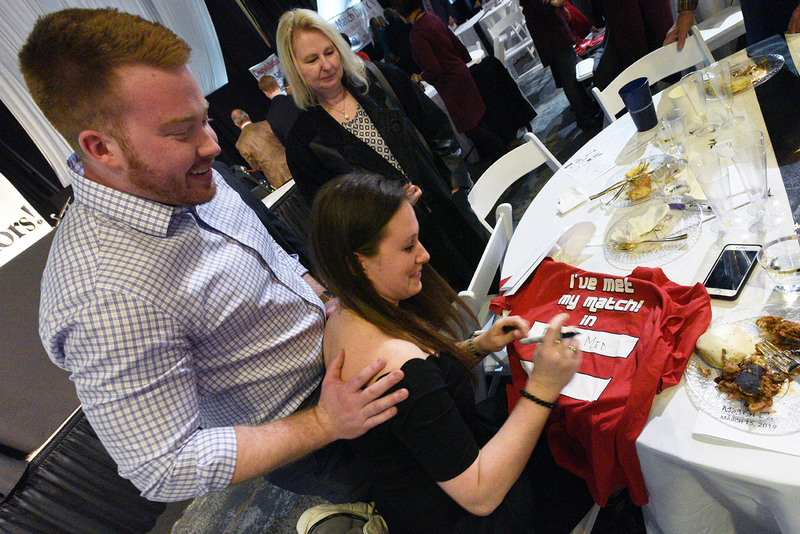 A student fills out her T-shirt with the location of her residency and the specialty. Nationwide, the 2019 Main Residency Match was the largest in NRMP history. A record 38,376 applicants submitted program choices for 35,185 positions, the most ever offered in the Match. Of those, 7,826 failed to match. At the UAMS Match Day event, held at the Metroplex Live, the class of 2019 also re-enacted another tradition. It can be nerve wracking to wait for your name to be called, so each student who goes up to the podium puts cash in a vase. The student whose name is called last gets a big cash prize for their extra stress from waiting. Daniel Escobar realizes he has won the cash jar for being the last student to have their name called. Escobar was this year’s winner. For couples and families with children, Match Day poses additional logistical challenges. Often couples are trying to match in the same geographical area, while still considering each other’s career goals. There is a “couple match” option through the NRMP that tries to factor in geography, but still, it’s tough. Assistant Dean of Undergraduate Clinical Education Sara Tariq, M.D., center, sorts through the match envelopes. Rachel and Cale White held their baby, Kade White, after the ceremony and reflected on the stressors of the last few months. They were relieved when they found out they both matched at UAMS, where Rachel will be working in emergency medicine and Cale in physical medicine and rehabilitation. “It’s exactly what we were hoping for,” Rachel said. For Jessie Koster, who has been at the UAMS Northwest Regional Campus in Fayetteville for the last two years, Match Day was also a fun time reuniting with her classmates. Given the difficulties of medical school, students can forge strong bonds. Richard Wheeler, M.D., executive associate dean for academic affairs, readies some of the match envelopes before the event. This year, 53 percent of the UAMS students matched in primary care — internal medicine, pediatrics, family medicine or obstetrics/gynecology. One of UAMS’ goals is to inspire doctors to stay in Arkansas for their careers, particularly those in family medicine. 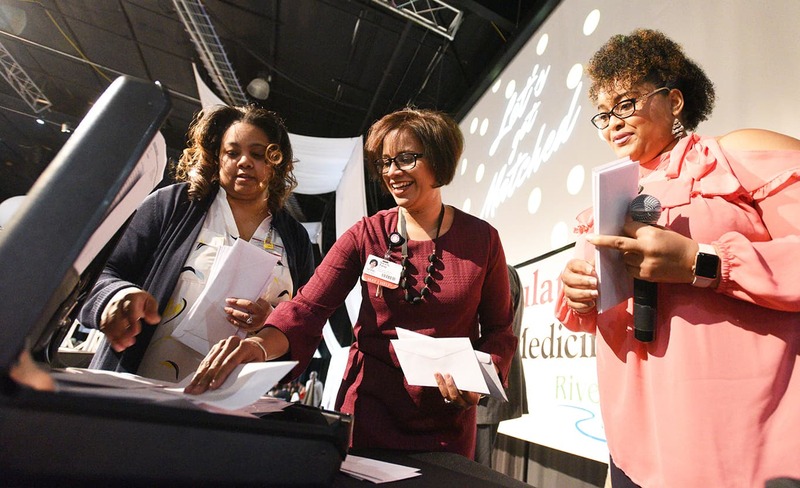 Of the class of 2019, 72 seniors have taken residency positions in Arkansas. The remaining 88 took positions in 32 different states. 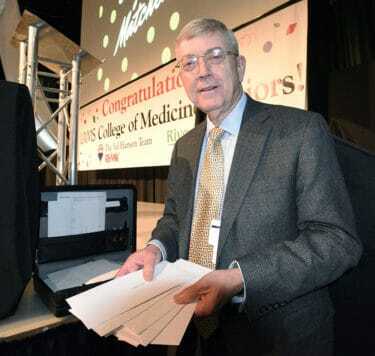 Richard Wheeler, M.D., executive associate dean for academic affairs in the College of Medicine, started keeping statistics related to Match Day in 2005 and helps organize the event. Wheeler said UAMS is working with other hospitals and programs in the state to open additional residency slots in an effort to train more physicians in Arkansas to fulfill doctor shortages. Every year the staff continues to help students find positions even if they didn’t match in the first round.